Download and install the GateOne Add-On. Click the link for the GateOne web interface and configure it. 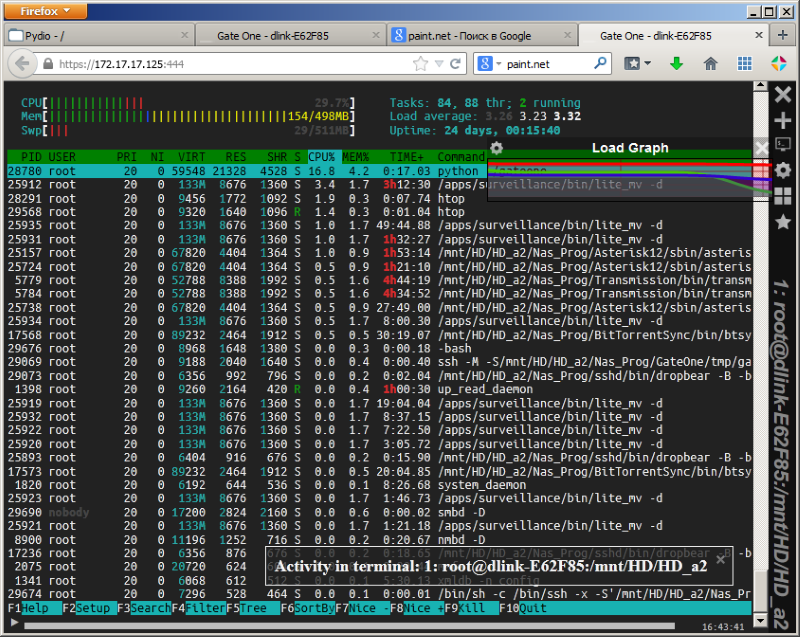 I use the Dlink DNS.327L NAS. Python addon Python2 v.1.04 was installed before I added Gate One. Unfortunately when I tried to run Gate One nothing happens. I get a blank black screen with a "X", "+" and a "*" sign in the upper left corner. When I select the "*" and activate the feature "Übergänge" then I see the attempt the Gate One tries to connect to Gate One Server - but without success. I would like to show the printscreen - but how can I transfer the jpg file into this forum? when trying to "insert image" there I get only a "Enter image location" with a http:// in it. "The message exceeds the maximum allowed length (20000 characters). " Put a picture on Dropbox, GoogleDrive, box.com, etc. Click the Sharing button and paste the URL in the post from the "cloud"
Here we go - but I do not think it would help you much? But is it so compicated to add a simple screenshot ito this Forum area? [url=http://postimg.org/image/wgqdelnpb/][img]http://s27.postimg.org/wgqdelnpb/Screen_Shot.jpg[/img][/url]You need the >IMG<linked code. Looks like the "bug" of the browser. With my smartphone works fine under Firefox. What is the username/password one should use to login to the localhost ssh? GateOne is the only ssh client! For access to localhost you need to activate the ssh daemon. Note: Only the admin account can login this server via SSH.